In this article, we will take a tour of the Joomla Administrator Control Panel and make some important changes to the initial configuration of our new Joomla website. This section covers a lot of ground. We have therefore divided it into 10 topics which cover different links in the Control Panel Main Menu. #2...Getting Started with Systems, Global Configurations. This tour is a good way to learn more about the various tables and functions of the Joomla Control Panel. 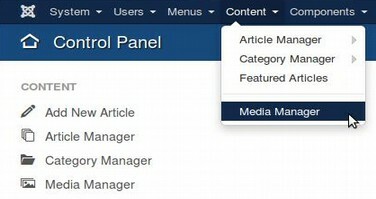 To log in to the Joomla Control Pane, go to mysite.com/administrator. After installing Joomla and logging in, you will see a control panel with several Welcome messages. After deleting all of the Welcome Messages and three module boxes, your control panel will look like this. All Joomla websites come with a front end which is seen by the public and a back end that is seen only by administrators. Here is the front end of our new Joomla website without any sample data. The best way to learn Joomla is to install your own Joomla website with no content and then make the changes to your configuration as we describe them. However, if you do not have a Joomla website, there is another excellent way to learn about the Joomla Administrator Control Panel which is to go online to Joomla.org and log into their DEMO Joomla Control Panel. Click on the big blue Demo button. Sadly, this takes us to a page trying to sucker us into registering for a SiteGround US web hosting account. But you can still test drive Joomla without signing up for a SiteGround accoun by scrolling down the page and clicking on Launch Test Drive. The site we will look at will only last 90 minutes. But this is more than enough time to see what the back and front ends of the default Joomla website look like. 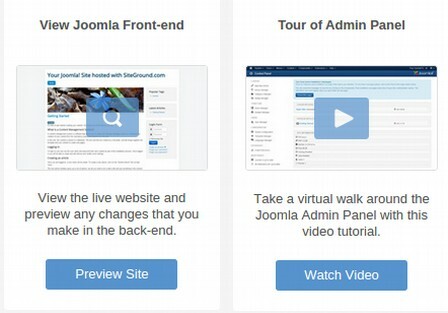 Clicking on tour of the Admin Panel will take us to a SiteGround tutorial about Joomla. 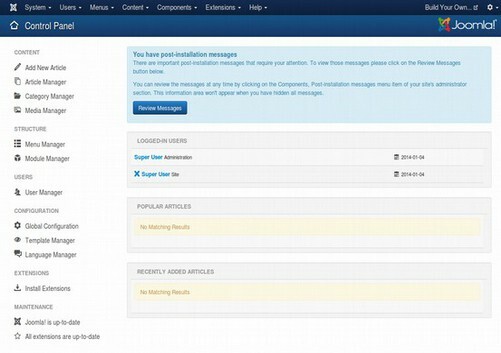 Clicking on Preview Site takes us to a similar Joomla Tutorial by Joomla Co-Founder and Developer Brian Teeman. We will skip these videos and look directly at the control panel of our Demo site. We will begin our tour of the Control Panel by looking at the top menu. 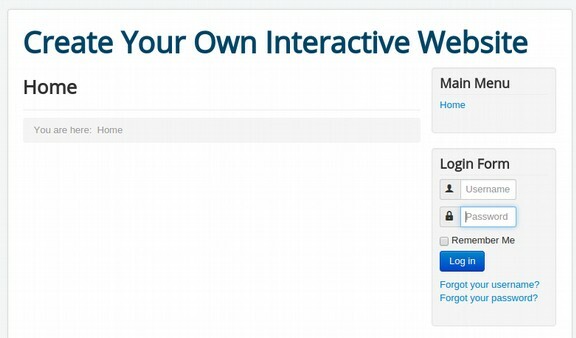 The link to view the front end of the Demo website and the link to log out of the control panel are on the upper right. The remaining menu items, from left to right are System, Users, Menus, Content, Components, Extensions and Help. Hovering over any of these menu items brings up their drop down menus. The drop downs for each of these menu items are shown below. Arrows to the right of submenus indicate quick links such as “Add New Article.” In this article, we will focus mainly on these four menu items. The remaining menu items will be reviewed briefly here and in more detail in later articles. We will begin with the System Menu Item. The first submenu item, Control Panel, is just a quick way to get back to the main control panel screen from any other screen. Think of it as the HOME button on most websites. #2... Getting Started with Systems, Global Configurations. We will next change a few Global Configuration settings. To reach your global configurations screen, go to System, Global Configuration. There are a couple of important initial tasks we want to take care of on this screen. First, make sure your site is online by confirming that Site Offline is set for NO (as shown above). Second, increase the Default List Limit from 20 to 100. This will make it easier for both you and your viewers to view complete tables rather than partial tables. Third, scroll down to Meta Settings and add our Meta Description and Meta Keywords. This will help search engines properly categorize your website. Your site meta description should be no more than 150 characters long – or about 20 words long. For key words, do not add more than 20 key words, each of which must be separated by a comma. Note that there is a drawback in using a Global meta description in that it means that any page on your website which does not have its own unique meta description will be assigned the global description. This in turn means that many of the pages on your website will have a “duplicate” description which is something that search engines do not like. Therefore if you assign a global meta description, you should also add a free Joomla extension to automatically generate unique meta descriptions for each page on your website. 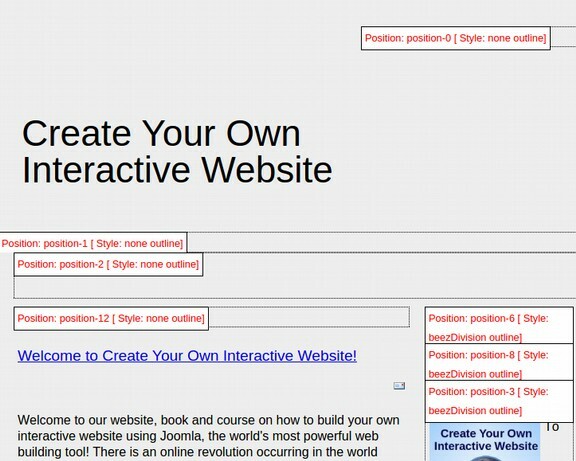 We review how to do this later in our article in Search Engine Optimization Tools. Next, scroll down further on the Global Configurations screen and change the Search Engine Friendly URLs from no to yes. The settings in this category should be adjusted when you first build your website. If you change them later, many of the menu items and internal links on your website will be broken. Also change Use URL Rewriting from no to yes. If use URL Rewriting is set to NO, the URL to this content article page will include “index.php” which is bad because this can confuse your readers. Note that there is a dot placed in front of the word htaccess but there is not a dot after the word htaccess. If you followed our previous instructions, we have already done this while we were still in Cpanel and right after we installed Joomla to our website. If you skipped that step, then you need to go to your web hosting account, open Cpanel, open your file manager, look for the htaccess.txt file and do that now. As we explained previously, you should also open the .htaccess file with your File Manager. Then locate a line that says #RewriteBase and delete the hash character (#). This only needs to be done for your primary domain root folder – not for any addon domain folders. Then click on the System tab at the top of the screen and reset the Session Lifetime from 15 (minutes) to 99 (minutes). This parameter determines how long a user has on your website before being automatically logged off. Because it is rude to log off a user who is reading your website (and also not a good way to treat your customers), you should raise this setting to at least 99 minutes. The web host we recommend, Fullhost.com by default sets up a secure free SSL encryption system called Lets Encrypt in your Cpanel. This is discussed further in our next chapter. Once you verify that Let’s Encrypt has been set up in Cpanel, you can activate it by going to the Global Configurations Server tab and changing the setting for “Force HTTPS” from None to Entire Site. Next, we will go to Users, User Manager. This will bring up the following screen. On the Demo website and a real website, it initially shows a single user called Super User. For security reasons, we should edit the admin name from Super User to your name. Double click on Super User to bring up the Edit screen. Or select Super User and click on Edit. For security reasons, you should also change your password to something different from what you used to install your website. Then click Save and Close. 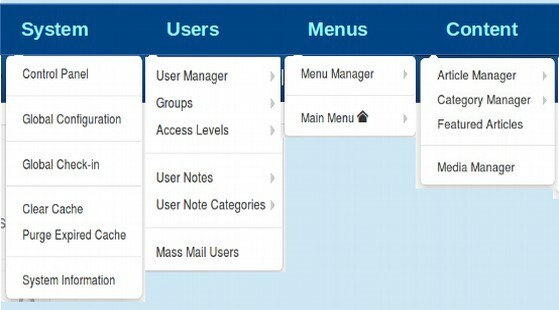 Click on Users, Groups and you will see several levels of groups. You can edit and add to these groups. But for now, we will leave them and the Access levels associated with these groups at their default settings. Next, we will go to Menus, Menu Manager. The Demo site has one menu, called Main Menu. It has been linked to a Module also called Main Menu that we will look at in a moment. To see the menu items associated with the main menu, click on Menus, Main Menu. Click on Help in the upper right corner to learn more about what each tab does. Note that the Ordering tab disappears if you make your screen too narrow. Click on NEW to bring up the Menu Item Edit screen. 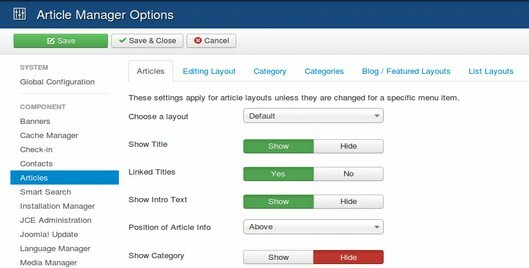 Then click on the big blue Select button to see all of the Joomla Menu Item types. We will discuss these in a later chapter. For now, click Cancel. Next, go to Content, Article Manager. On the demo site, there is only one article called First Article. To add an article, give it a title and some text. You do not need to put anything in the Alias box. 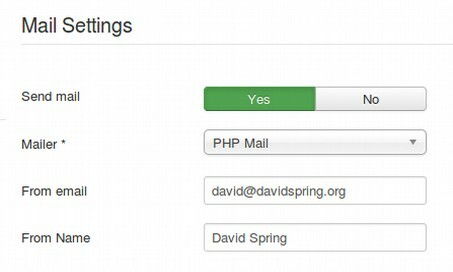 Joomla will automatically generate an Alias based on your title. Remember that the title should not exceed about ten words for Search Engine Optimization. If you want, you can assign the article to a category and decide if the article will be Featured (which means that it will appear on the Front Page). If you do not want the article appearing on the front page, then the only way to view the article will be to create a menu item for the article AFTER you have first created the article. You can add images to your article by clicking on the Images button at the bottom of the page – which will take you to the Media Manager to select an image. Once you are done creating your article, click Save and Close. To view your new article, assuming you made it a featured article, click on your website front end link in the upper right corner of your control panel. One of the first things we should do when we start a new website is create a Welcome article and publish it as Featured. For now, just type “Welcome to our website!” for the title and type a sentence for the text. Change Featured from No to Yes. 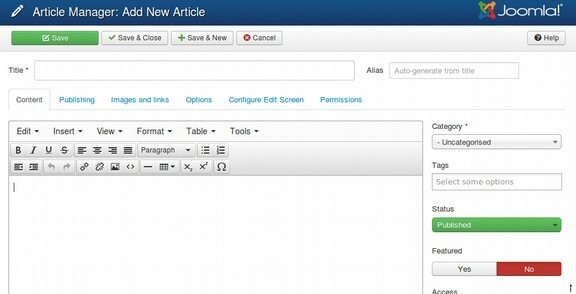 Another important screen is the Content, Article Manager, Options screen. To reach this screen, click on your article manager. 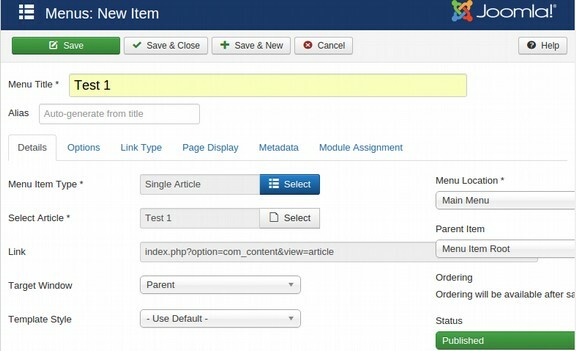 Then click on the Options button in the upper right corner of this screen under the Joomla icon. Here you can specify which items appear by default on the article pages, the category blog pages and the category list pages. There are dozens of potential settings. We will hide the category, the author name, the published date, the modified date, the tags and the hits. Then click Save and Close. Next, go to Menus, Main Menu, Add New Menu item. For Menu Title, use Test 1. For Menu item Type, select Articles, Single Article. 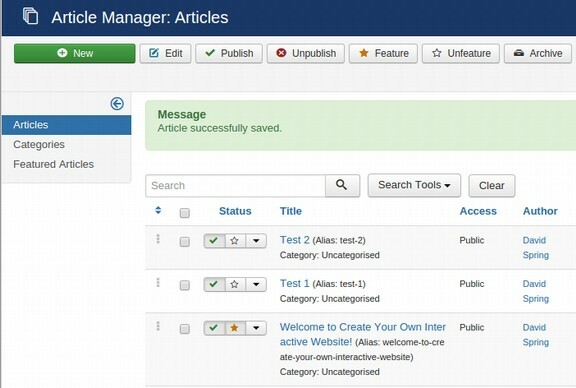 This will bring up the Article Manager screen where you can select any article you have already made. Select Test Article 1. Then click Save and Close. This will place the Test 1 menu item in the top level of the Main Menu. For the second menu item, call it Test 2. For Menu Item Type, select Articles, Single Article. 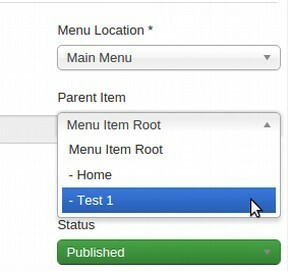 Link the menu item to the Test 2 article. Then in the right hand column, use the drop down arrow to select Test 1 as the Parent Item. Then click Save. Now click on your site name to view the front end of our site. Click on Test 1 menu item and Test 2 should appear. If it does not, you may need to make changes in your .htaccess file as described earlier. Next, click on Content, Category Manager. There is only one category on the demo site. It is called Uncategorized. To create a new category, simply click on the green New button. Below is a category manager with a few more categories created. The Add A New Articles Category screen looks like the Add New Article screen. This is what makes Joomla very user friendly. Nearly all of the screens look the same whether you are adding a menu item, an article, a category or a new module. One screen that is a little different is the Media Manager which we will look at next. Next go to Content, Media Manager. Note that you can also reach the Media Manager via the Quick Links side menu in the Control Panel. The benefit of getting use to using the top menu rather than the side panel is that the side panel is only visible when you are at the Control Panel screen whereas the top menu is visible and available from any screen in the Administrator backend. A primary goal of this introduction is to help you learn where links to important functions are located in the Joomla Administrator Main Menu. Clicking on the Media Manager will bring up the following screen. There are two views of the media manager. Above is the thumbnail view. To see the detail view, click on the Detail View tab. When we have our own website, we will delete all of these sample data images. Then we will delete the folders holding the images. Then we will create our own image folders and image sub folders. Then we will add our own images inside of our folders – with one folder for each article on our website. To delete images, from the thumbnail view, simply select the images you want to delete, then click Delete. To delete folders, they first need to be empty, then select them and click delete. To create a new folder, click Create New Folder. Give the folder a name using only lower case letters and numbers with no spaces. Then click Create Folder. If you have a complex website with ten or more categories and four or more articles per category, first create your categories with the Category Manager. Then create your category image folders. Then click on the category image folder to open it. Then place article image folders inside of these category image folders. Then load your article images into these folders. Below is the Media Manager folder structure for our website after adding a bunch of folders. Next, go to Extensions, Extension Manager. 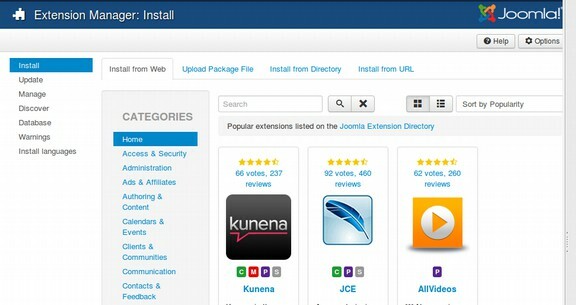 A new feature that comes with Joomla 3.5 is the ability to install many Joomla extensions directly from the Extension Manager screen. This feature must be enabled the first time you visit this screen. In the past, we would need to go to the Joomla Extension Directory (clicking on the link in the Help Menu Item). Then we would need to click on Downloads to be taken to a page on the Extensions website. Then we would need to download the extension we wanted to the Downloads folder on our home computer. Then we would need to go back to the Extension Manager and click on Upload Package File. Then we would need to navigate to the extension zipped file in our Home computer Downloads folder and select it. Then we would need to click Upload and Install. We can still add extensions the old fashioned way. But by enabling Install from Web, we can skip all of these steps and research and install extensions directly from the Extension Manager Install screen. One of the most important extensions we should add to our website is the JCE Editor which is shown above. If you have your own website you are building, go ahead and click on the link to see how the new installation process works. You can also click on links in the Categories side menu to research other Joomla extensions. On the far left is a side menu you can use to update extensions. You can also uninstall extensions and templates you no longer want by clicking on the Manage button in the left side menu. Next, go to Extensions, Module Manager. This will bring us to a screen with three or more modules. Modules are boxes of content such as text and images that you can display on any or all pages of your website. Your main menu is an example of a module. 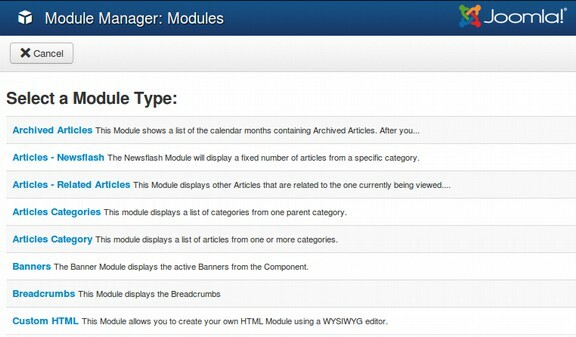 The module manager screen is very similar to the Main Menu Manager screen and the Article Manager screen in that you can drag and drop modules to change their order, create new modules and/or unpublish and delete modules. If you are working with a real website, it is useful to hide the User Log In module to avoid spammers attacking your website while you are building it. To hide this module, go to Extensions, Module Manager. Then select the Login form. Then click on Unpublish. We will replace it with a better option later. Also unpublish or delete any other modules you do not want or will not need. Drag and Drop Module Order Sorting. To change the order of a module in the Module Manager table, first select “Ordering” rather than “Position” from the filtering box above. Then in the far left column, select the three black dots. This will turn the module you want to move green. Then hold down your mouse and move the module to a new position. Then release the mouse. Below is a module called Breadcrumbs which is being moved to a lower position in the Module Manager table. You can create a new module by clicking on the green New button. 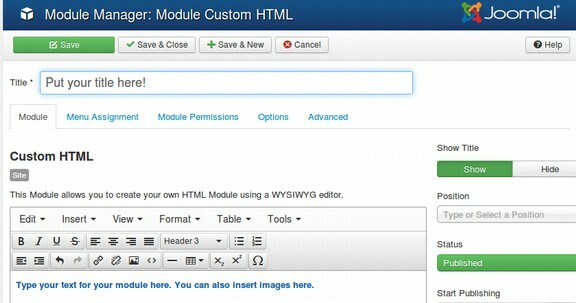 The most common new module is a Custom HTML module. Clicking on this link will bring up a screen that looks like the Create New Article screen. You can either show or hide the title of the module. In order for the module to actually appear, you first need to assign it a module position, which will depend on the template you are using. Then you will need to assign it to one or more pages by clicking on the Menu Assignment tab. Finally, you can give your module a background image by clicking on the Options tab. Next, let's look at the default templates and template positions by clicking on Extensions, Template Manager. This will bring up the Template Manager Styles screen. The default front end template, as indicated by the Gold Star is Protostar. To change to the other front end template, Beez3, click on its star to make it the Gold Star. Then click on your site name in the upper right corner to view what you website looks like using the new template. Notice that the template typically does not change the content of your website. It merely changes its colors and appearance. If some items such as the header of your website suddenly disappear, this merely means that your new template is using different module positions than your old template. You can get the module to reappear by assigning it to a module position used by your new template. 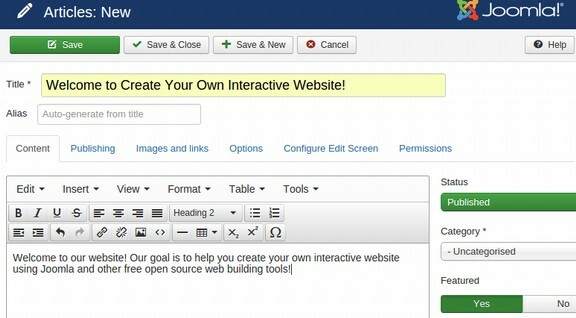 There are hundreds of free templates available for Joomla websites. We will review how to research templates in Chapter 3. Two of the most important factors in choosing a different template for your website are the number of customization options available and the number of module positions available. To see the customization options for the Protostar template either double click on it or select it and click on Edit. Then click on the Advanced tab. Then double click on the Beez3 template to see its options. It also has very few options. 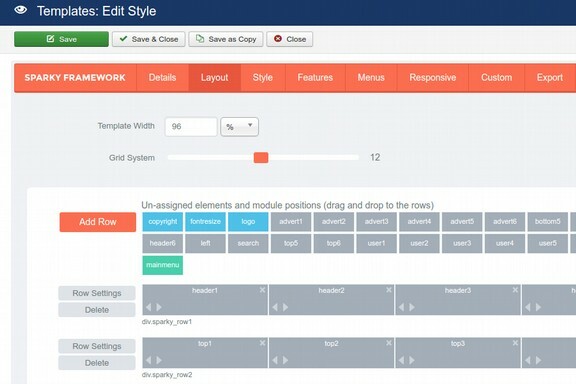 To see the module positions for the beez3 template, go to the Template Manager, Styles screen and click on “Templates” in the upper left corner. Under Beez3 Details, it says that a Preview is not available and must be enabled in options. So click on Options in the upper right corner. Click Enabled. Then click Save and Close. This returns us to the template screen where this now a blue “Preview” link for each template. Click on Beez3 Preview. Beez3 has 7 module positions near the top of the page. Scroll to the bottom of the page and you will see 4 more module positions for a total of 11 places to put content on our website. Beez3 offers very few module positions. This makes it difficult to precisely place your modules where you want them on your website home page. Equally bad, the module position names are not at all descriptive. They are simply “position 1, 2, 3, 4, 5 and 6. This also makes it hard to place modules where we want them. The Protostar template is even worse than the Beez3 template. We will therefore describe how to add a better template call Sparkye to our website in the next chapter. With the Sparky template, we can easily create as many module positions as we want or need. This ability to locate content may not seem that important if you just have a simple personal blog in order to share stories with your friends. But if you have an online business with hundreds of products, having row and column placement options – with up to 16 rows per page and each row with up to six columns, having all of these options is essential. They are also essential if you want to build a large community organization where every subgroup of the organization can have their own space on the HOME page of the website. They are also essential if you are a photographer wanting to turn the HOME page of your website into a photo or video gallery. With module positions, it is better to have them and not need them than to need them and not have them. If you have problems with your website, there are lots of ways to get help. You can click on the Help button or go to the Support forum to read about the problems and solutions of others. You may also find a tool in the Joomla Extension Directory that does what you need. You can also post your question on our course forum at collegeintheclouds.org. 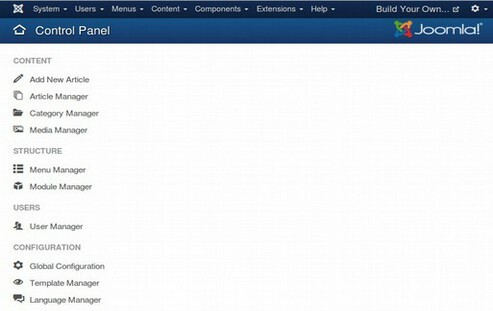 This concludes our tour of the Joomla Control Panel. 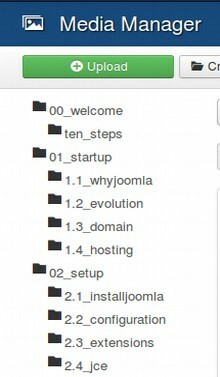 In the next section, we wile review how to use the Joomla Extension Directory and describe some of the most important extensions we will be adding to our Joomla website.